Stunned families watched as the lights in the sky lined up in a flying formation before disappearing upwards into space. The close-encounter snap was taken by quick-thinking engineer Paul Slight on his mobile phone at about 10.30pm on Sunday. 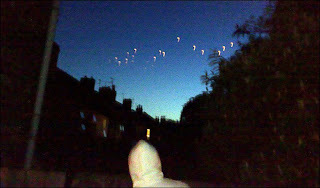 He was coming home from a day out cycling with friends in Lincoln when they spotted the lights in the sky. The eerie extra-terrestrial crafts were hovering in the night sky over the town moving in different directions before eventually shooting straight up into the atmosphere. In a series of stunning images taken over five minutes, Paul, from Lincoln, captured the objects together and even flying in an apparent formation. Paul, 54, said: "There were 26 of them at first, dodging and darting in between each other like they were playing a game. "After that, seven more arrived from the right hand side and weaved through the crowd of lights like strange kinds of aircraft. "After five minutes of moving around, the flickering yellow objects hung in the air for a second then shot off into the sky and disappeared. "I have no idea what they were - I'm not usually a believer but what I saw was really weird."